Inside the villa, you will find different bedrooms, each with a private bathroom and personal shower; every bedroom is characterized by its own unmistakable style. Colors and furnishing, taylor-made for each room, give a touch of individuality and pleasant harmony. To make your stay as comfortable as possible, you will find an audio / video system with satellite reception and to satisfy the most varied of tastes, there is a refrigerator with drinks and snacks. No experiences yet with Maison Brinati. Be the first! Did you stay in Maison Brinati? Let us know what you thought about it and help others to make the right choice! * I confirm having stayed in Maison Brinati. 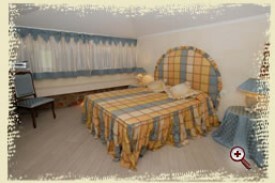 Find other bed & breakfasts in Monsummano Terme or all bed & breakfasts in Tuscany (Florence).